Get a taste of what’s in store on April 2nd, at Evolve 19! Evolve 2019 is the largest gathering of event organisers, PCOs, in-house event managers and special event managers from all sectors; corporate, association and government in Australia. This year, Evolve 2019 will host Paul Allen as a Featured Speaker. Paul is Managing Director of Margin Partners and is recognised as Australia’s Leading Authority on Supplier Margin. Paul’s “Take Back Your Margin!” presentation is an interactive experience that offers participants the opportunity to calculate where, why and how much profit, they are unintentionally losing in their business today. 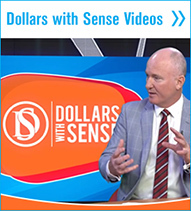 Enjoy this video of Paul Allen on the “Dollars With Sense” show for a taste of what attendees can expect at the conference on April 2nd! We look forward to seeing you at Evolve 2019! Paul Allen: Margin Partners is a group of executives that came out of big corporate companies and actually came up with a mission to help suppliers stand up and look after the margin they’re entitled to. A lot of suppliers today bemoan the fact that they’re being squeezed, put under pressure, and we work with them to help them understand the worth they have and how to protect that value and leverage that value. It’s not so much the product always—it’s how it’s delivered, whether it’s on time, whether a customer wants more, whether they want rebate dollars. There are many ways a customer can effectively squeeze a supplier for more than was originally agreed to. So, we’re actually helping suppliers to understand all the touch points of service they have with a customer and how to ensure they’re not over servicing or incurring too much more cost, or if they are asked for the extra revenue, how to upsell that extra service. So it’s protecting your space. We refer to the margin model, which is on screen, and with the margin model there are three key things we advise the clients to do. Number one in that example is know your cost to serve. What will it cost you in total to service that customer? Now, not just the standard costs, but what are the additional things you might do like being called up to deliver on Saturday or suddenly send an urgent order that’s going to cost you more? You need to understand your cost to serve. It’s knowing all those things, and often business owners don’t realise all the things their staff do to keep the wheels turning, so you’ll work out your cost to serve with your finance person and also with your key staff. You get the quantitative and qualitative data to know your cost to serve. Once you’ve done that, the next thing you then have to develop are your value propositions, or to develop your different service offerings. People understand this when you say you buy a premium fare or a discount economy or a first-class or business fare. Airlines do it very well—you pay for a fare and you get certain things, but you may travel in a more comfortable manner. But the key thing is to develop propositions that are priced in an appropriate way, so you protect your margin at all times. Once you’ve done that, the final thing is living to that value offer, i.e., you teach your people how to treat your customer—you don’t let them come and take more than what they’ve agreed to buy. So it’s instilling a sense that you are going to buy an economy fare, that’s what you get. We don’t suddenly say, “Hi, today you can have the discount and you will fly your business” —it’s like if you buy economy, you travel economy. So it’s protecting what you’re offering based on the cost that you know and understand. And what they do is re-engineer how they can bring the spacecraft back with a smaller amount of energy. So they turn off the air conditioning, there’s no stereo, there’s no food and at the end of the film, they get the astronauts home in a very rough condition, but they still get them home. It’s the same with business, if you’re being squeezed on price, you have to re-engineer the cost to serve so that you’re always protecting your margin and you may make it back or you may not, but at the very least you’ve got to try and always protect your margin; otherwise, you won’t survive. But re-engineering your offering under pressure is how you adapt. It’s back to the margin model. The way to do it is obviously detailed, but the principles are the same. Know your cost, know them intimately. Once you know your cost, package up different offerings to your customers to come with different price points, and then once they choose one, stick to it. Make sure your staff lives to that offering like if you’re flying first-class, you get first-class service or if you’re only going to buy economy, that’s what you’ll get.